Over 100 transit supporters joined MARTA Chairman Robbie Ashe, BeltLine creator Ryan Gravel, Advance Atlanta board members and several local transit organizations last Sunday to help push transit expansion in the City of Atlanta this November. Advance Atlanta, a citizen-driven grassroots advocacy coalition, hosted their first annual Transit Fest at Park Tavern drawing the large crowd to learn more about the opportunity city residents will have this November to vote on a referendum to expand transit. The planned referendum is the result of the efforts of State Senator Brandon Beach (R – Alpharetta), who sponsored pro-transit legislation in the General Assembly earlier this year. The event was free and open to the public. Guests had the opportunity to donate funds that will be used to promote the November referendum through various mediums of communication and grassroots organizing events. 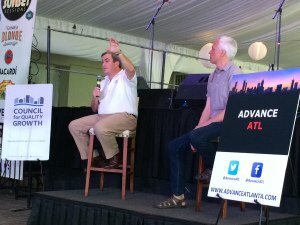 Speaking at the event, Atlanta BeltLine creator Ryan Gravel encouraged attendees to support the upcoming transit vote to enhance the city’s growing connectivity and walkability, stating, “The world is watching what we’re doing”. Gravel’s vision for the BeltLine includes eventual light rail parallel to the current walking trails and connecting to MARTA’s heavy rail system. Joining Gravel in speaking to the group was MARTA Chairman Robbie Ashe. An Atlanta native, Ashe grew up using MARTA trains and buses and now chairs the nation’s eighth largest transit system. He explained the importance of passing the additional funding stream this fall that will provide an additional half-penny for much needed transit expansion. The funding stream will assist in leveraging additional federal and bond funding for capital projects. He also announced the utilization of stretch buses that will serve greater numbers of long distance commuters. Atlanta City Council members Caesar Mitchell and Kwanza Hall also attended the event, providing their support to Advance Atlanta and this November’s transit referendum. Stressing increased equity in transit development, the council members explained the importance of a transit list that promotes doing the most good and creating opportunity for Atlanta’s diverse citizenry. As the transit vote draws closer, the city council will oversee the development of the project list that will be funded through the proposed additional revenue stream.